You are probably most familiar with the Chinese words Kung Fu as referring to the martial arts. This however, is by association and these words actually have other meanings in Chinese. Kung Fu actually refers to hard work, labor, and dedication toward any task or any goal. Kung Fu Cha (Cha means tea) is the Chinese tea brewing process that incorporates all these meanings. Here's how to indulge in the beauty and warmth of Kung Fu tea in the comfort of your own home. Appreciate the tradition. In the Chinese traditional tea culture, Kung Fu tea has a certain etiquette that goes along with it, a procedure that drinkers follow. Each different place adds various details. Study the various ways in which Kung Fu tea is served and enjoyed, and eventually you will develop your own unique way. Get a tea set: This will include a tea tray (hollow tray with a container inside which can contain all the water that will be spilled during the process), teapot, fair cup (a separate tea vessel), tasting cups, and aroma cups (sniffer cups). Prepare the tea leaves in advance, so that they are ready to be placed in the pot as soon as it has been warmed. A tea caddy, or “tea presentation vessel," is recommended for this purpose, as is a proper set of tea tools. Approximately one to two teaspoons of leaves is a good quantity to begin with and is easily adjusted to taste after the initial infusion. Keep in mind that due to the many variations of tea processing, some leaves are a lot more compact than others. For instance: in terms of volume of leaves, you will need less Tieguanyin than Yan Cha or Formosa Oolong. Rinse all vessels with hot water. This signifies that the ritual of tea making has begun by purifying the pot, cleaning it of dust and residue and making it ready to receive the tea. It also warms the vessels since the hot water is then poured into the serving pitcher and from there into the tasting cups. This is done because at room temperature ceramic teaware is usually quite cold and unsuited to brewing fine teas whose temperature must be carefully controlled. After rinsing, the water should be discarded into the draining tray or a waste water bowl. Before infusion, pour hot water over the leaves and then quickly pour it off. This removes any dust from the leaves and begins to open them up—-releasing the tea’s aroma, which should be savored prior to infusion. This set prepares the palate to appreciate the full flavor of the tea. Use pure or mineral water to brew the tea. Tap water should be avoided, since its chemical treatment imparts undesirable flavors and odors which interfere with the delicate aromatics of tea. (Home filters and other water purification systems can minimize and, in some cases, eliminate these problems.) The best water for tea brewing is spring water with a natural mineral content that’s neither too hard nor too soft. Since T.D.S., “total dissolved solids", or mineral content measured in parts per million, varies greatly from water to water, you may want to do your own taste-test of waters available in your area to determine which one has the best flavor, body and compatibility with the tea you drink. Fill the pot to the top with hot water and cover. Pour water over the top of the pot, drawing the stream over the air hole until a little water comes out the spout. When this occurs, you know the pot is full and heated to the right temperature. Pour the water into the fair cup to heat it. A fair cup allows the tea to be poured from the teapot into a holding vessel. Sometimes these fair cups use a filter to trap unwanted tea particles that may have passed on from the teapot. Add tea leaves and let steep. Oolong Tea: For light oolongs, such as Bao Zhong & Imperial Green, use 70°-80°C (158°-176°F) water and an infusion time of 3 to 5 minutes. For darker styles, including Tieguanyin & Yan Cha—between 80° and 90°C (176-194°F) again steeping 3 to 5 minutes. Black Tea: You will probably find that water between 85° and 95°C (185°-203°F) and a three minute infusion works best for black tea. You may want to experiment with lower temperatures and longer steeping times. 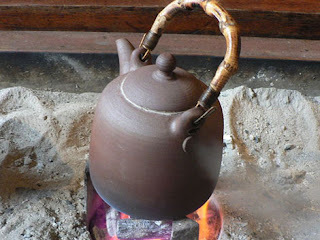 Puerh Tea: Use water that’s just come to a boil and infuse 3-5 minutes. When the leaves have infused their essence, pour the tea out into the pitcher (fair cup). This intermediate step between the teapot and the individual cups allows the tea to be mixed while pouring (the first tea coming out of the teapot will be less strong than the one on the bottom of the teapot). Moreover, it allows to precisely adjust the brewing time in the teapot (all the tea comes out quickly, instead of being slowly poured in the individual cups). From the fair cup, distribute the tea in the aroma cups, keeping the pitcher close to the cups and pouring slowly. This reduces the movement of the tea, maintaining its temperature. After the aroma cups are filled, position one tasting cup, upside down, over each aroma cup. After tasting cups are positioned, take each cup pair and quickly flip it: this is a very delicate step since the cups are becoming hot on the outside. Notice that the tea will not spill out because no air can enter the aroma cups. After this is done, each guest will simply lift the aroma cup from the tasting one. Another option to this step is to give each guest the aroma cup and separately the tasting cup. The guests will then simply pour the tea from aroma to tasting cups and proceed by smelling in the same manner. At this point, the aroma cup can be brought near the nose to receive the fragrance of the tea by inhaling the steam. After smelling, drink the tea from the tasting cups. 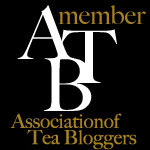 Drink by taking small sips that allow to fully enjoy the taste, aromas and qualities of the tea. A good green tea will allow up to four or five brews. Add water to the teapot and start again from point 10 to your will.